Chimeral Insight: Ibogaine-Can I Buy Some? The answer is no, you cannot buy ibogaine. At least, not in the United States and not very easily anywhere else in North America - at least not for 'recreational' purposes. Ibogaine was promoted as a diet drug in France in the 1800s (called Lambarene) and was looked into by the American CIA as a potential tool for their activities in the 1950s ( much as they had looked at LSD as a substance with potential use for pharmaceutical mind-control or as a 'truth drug'). The mechanism of action of Iboga is similar to that of other psychedelics such as LSD, psilocybin, mescaline but the drug also has a dissociative effect (feeling of 'detachment') similar to an anesthetic medication called ketamine. This root-derived alkyloid, ibogaine, produces an 'altered state of consciousness' (see post: Altered States of Consciousness), a state of dream-like hallucination sought after throughout the history of religion. Research into the use of this drug has been carried out in many jurisdictions, mostly examining its psycho-active properties. Crystalline salts of 'ibogaine hydrochloride' are the most effective form of the drug, this preparation made in a semi-synthetic fashion (the completely synthetically-made product is much more expensive) using a similar alkyloid from another type of plant. From a therapeutic perspective, Ibogaine has been used in psychotherapy (Naranjo-France), in the treatment of chronic pain (the drug has the ability to enhance the effect of narcotics) and experimentally in the treatment of opioid (narcotic) addiction in Canada, Mexico, Great Britain, The Netherlands and several other countries. In the U.S.A., ibogaine is classified as a Schedule 1 substance by the Food and Drug Administration and is essentially banned from legal use in the same way as is psilocybin, mescaline and many other 'religious-use' drugs. 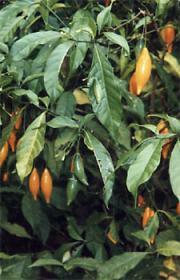 Side effects of the ingestion of ibogaine include dry mouth, nausea, dizziness, loss of balance, irregular heart beat. Some cases of death have been attributed to the use of this drug. So, if you want to see the dead, talk with your great grandfather or ask Julius Caesar, face to face, what made him decide to 'Cross the Rubicon', you may have to travel to Central Africa yourself and ask a 'Bwiti' practitioner, one of the 'Seers of the Dead'.